On 17th January 2011, Training and Development Bureau, MRC Talhah collaborated with Islamic Care Bureau, MRC Maimunah and Dakwah and Tarbiyyah Bureau, Profaz Club had organized an intellectual discourse entitled “Syiah: Does it contradict with Islam? How about other ideologies?”. 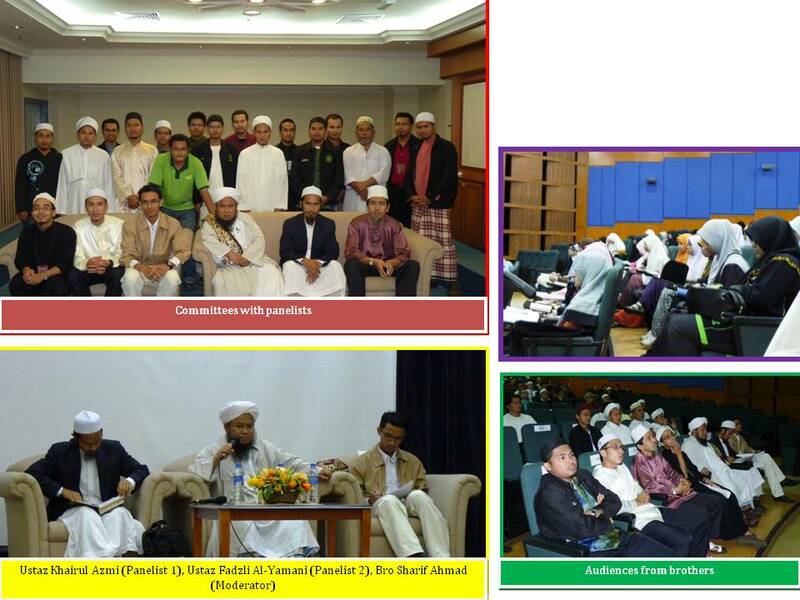 The event was held at Main Auditorium, Kulliyyah of Medicine, IIUM Kuantan and started on 9.00pm until 11.30pm. About 400 audiences had joined this programme and had a fruitful question and answer session. The talk was conducted by a great moderator, Bro Sharif Ahmad, a third year student of MBBS, IIUM Kuantan and two generous panelists who were al-Fadhil Ustaz Khairul Azmi Ismail (a Mudir from Maahad Tahfiz Darul Fikri, Kuantan) as the first panelist and al-Fadhil Ustaz Syed Mohd Fadzli al-Yamani (one of the columnist fiqh from Solusi and also a Mudir from Madrasah al-Yamani, Kuala Lumpur). Furthermore, among the guests who also joined the event were Principal of Mahallah Talhah, Ustaz Mohd Ali Abdullah, Dr. Nurziana Ngah as Fellow Mahallah Maimunah, President of MRC Talhah, Bro Ahmad Saifuddin Othman and representative from MRC Maimunah Sis Nor Mashitah Mansor. Nowadays, there is an issue of Syiah in Malaysia. How many of you are really aware about Syiah? According to the Islamic Jurisdiction Administration Enactment of 1989, Syiah is considered a deviation from Sunnah Wal Jamaah as some of its teachings contradict from aqidah and syariah views. At the same time, there are other ideologies that contradict Islamic teachings like Islamic Liberal, Wahabi and so on. Last year, on the 17th of December 2010 as reported by media, Muslims were surprised with the news that “200 Syiah followers were detained by the Selangor Islamic Department (JAIS”). With a big amount of 200 people, analysis and critical observation of this condition boldly shows that our ummah today is paving its way towards destruction. It is agreed that the main factor is the lack of seeking Islamic knowledge in our society. Thus, the vision of the Intellectual Discourse that MRC Talhah is trying to initiate, are to revitalize the intellectual dynamism of Islam and the Ummah, Integrate Islamic revealed knowledge and values, seek to restore a leading and progressive role of the Muslim Ummah in all branches of knowledge; thus, the Intellectual Discourse was planned as a practical approach to fulfill this aim. Moreover, we also are trying to inculcate ikhwah and akhawat in IIUM, Kuantan to be alert and aware about any related issues with Islam especially the controversial issues that we must take part as one ummah.